Little Kids Shredz contain more than 60 percent sugar. 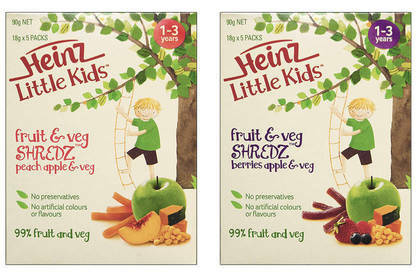 A New Zealand-made food product for kids has landed its maker, Heinz, in court in Australia. The Australian Competition and Consumer Commission (ACCC) alleges Heinz engaged in conduct liable to mislead with its Little Kids Shredz products. The snacks contain more than 60 percent sugar. The boxes they come in state “our range of snacks and meals encourages your toddler to independently discover the delicious taste of nutritious food” and “we aim to inspire a love of nutritious food that lasts a lifetime”. The main ingredients in the products are fruit pastes, concentrates and purees. The peach, apple and veg version is 69.1 percent sugar. It has 12.4g of sugar in one 18g serving – about three teaspoons worth. ACCC chairman Rod Sims said the organisation alleges Heinz is marketing the products as healthy for young children when they are not. “These products contain over 60 percent sugar, which is significantly higher than that of natural fruit and vegetables. For example, an apple contains approximately 10 percent sugar,” Mr Sims said. The Obesity Policy Coalition (OPC) alerted the ACCC to the product. OPC executive manager Jane Martin said Heinz was potentially misleading parents who were trying to feed their children nutritious food. “Heinz Shredz are promoted as a ‘nutritious food’ yet they are higher in sugar than some confectionery. We know that these types of foods, which are high in sugar, are not a nutritious choice for toddlers. They are not equal to whole fruit and vegetables and they contain significantly more sugar,” Ms Martin said. The outcome of the case has the potential to be of major importance to consumers on both sides of the Tasman. Our research continues to find examples of products promoted as natural or healthy that are high in sugar. We’re pleased to see the Aussie regulator taking action.